Well, since I made a “track listing” intended to be for an album, I thought I’d use it to organize my blog posts about our vacation as well. So here we are, starting out with the first night. We set out on Thursday night, August 16. I had taken time off work on Friday and the whole next week. We got a lot of our stuff ready on Wednesday, and Sarah had the car mostly packed by the time I got home from work on Thursday (naturally, I rode my bicycle to work). We packed a few additional items and left around 6:30 pm — earlier than we expected. Our plan was to drive to Jellico, TN, where we had reservations at a Days Inn for that night. 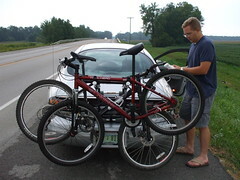 Once we reached I-65, it quickly became clear that the bike rack wasn’t working too well. The bikes were being blown around by the wind, and it was making me nervous. I exited the interstate and secured the bikes using some rope. I almost didn’t even bring the rope on this trip, wondering if we would need it. So, we learned two valuable lessons: 1. always bring rope and 2. my bike rack is OK for small trips, but not for long trips on the Interstate. The drive was pretty uneventful, and it got dark shortly after we entered Kentucky, so we couldn’t see the land on our way in. I could sense the land getting more mountainous and the road windier as we approached Jellico, but I really had no idea what it would look like in the morning. The Days Inn was pretty decent, there were no problems with our reservation, and we went right to our room. We found the Bible open to Psalms. I don’t know why this detail sticks out in my head, but it does. Maybe it’s the fact that I had no intention or reading the Bible, or the fact that we found the South to be every bit as religious as people seem to assume the Midwest is. There are a lot of religious people in Indiana, but it’s not as inescapable as we found it to be in the South. We wrote some things in our journals (which I’m not even referring to now), something we would only do once or twice more. I had a lot of trouble hand-writing my thoughts. I have crappy handwriting, and I can type a lot faster than I write. For whatever reason, it wasn’t working for me. We drank a couple of beers that we brought with us and tried to get some sleep, knowing the next day would be a long one. The Days Inn claimed to have a mountain view, but it was too dark to tell if that was true or not. We’d have to wait until morning to find out. As a former Georgia resident I can attest to the bible thumpery down there. Did you know Bloomington has it’s very own Guided By Voices day? I carry my bikes on top using a Yakima rack. But the pedals on my wife’s bike have the annoying tendency to windmill when we’re driving. I keep forgetting to tie them up before we leave on a trip and, as a result, I’m invariably stopping somewhere along the way to tie them down. I am always asked what church family I belong to, when I go down south. I have a very good knack at getting people to drop the subject. Not that I have anything against that lifestyle. 8>). I often get nervous on long distance travel with the bikes. In May, I put three bike on my rack and drove 5 hours to NYC. My co-pilot Steve was a lot more concerned than me. Since I was doing the driving and packing, his bike ended up on the outside slot. I know he wanted to say something, but really, what can the “guest” say? I enjoyed watching him squirm though. he he. I’ve also found that a good set of bungies are a godsend for things like this. 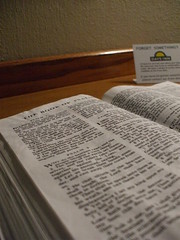 As for the bible thing, was it at least a good passage about a traveler finding peace on a long journey or sumtin’?